Project obstacles and solutions: In August 2016, Meijer Corporation broke ground on a 193,000 square foot store with a detached gas station. The 35 acre site was developed for both the Meijer store and outlots in a strip area that will be leased to retail businesses and restaurants. Pepper Construction served as the general contractor for this project and Lithko did all of the concrete work. The construction schedule for this project called for the entire job to be completed in seven months. The new store had a turnkey operational date of March 2017. IMI supplied 3,500 yards of ready mix concrete for the footings, paving of the curbs, sidewalks and gas station bays, as well as the floors of the store. 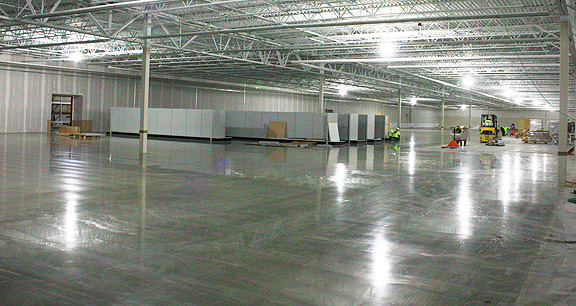 The concrete floors were polished and used as a finished surface throughout the building. One of the challenges when pouring the floors were areas where there were large number of plumbing drains. The places designated for refrigerated and frozen foods were replete with pipes. Not only did the concrete trucks have to maneuver around the pipes, but Lithko had to take extra care, as the slabs were specified to be poured at 4 inches in these areas and they were polished and used as finished flooring. IMI supplied 2,500 yards for these floor slabs. Large sections of sidewalks were colored with an integral color that was mixed on IMI's concrete trucks. The red hue was used on the lawn and garden area of the building. It used a roll curb and gutter to connect with the parking lot to make for easy loading in this area. Lithko provided the sidewalk and curb paving on the project. To keep the project on schedule required 250 yards of the garden area to be poured in December when the temperatures were below freezing. IMI QC/QA used imix FreezeGuard to speed up set times and keep the project moving. Set times are guaranteed within three hours when using imix FreezeGuard, See more about the imix FreezeGuard guarantee. For more information on pouring concrete over plumbing, or coloring concrete, contact the sales representative for the concrete plant nearest your location. Click here.